Background and objectives Older patients in the intensive care unit are at greater risk of AKI; however, use of kidney replacement therapy in this population is poorly characterized. We describe the triggers and outcomes associated with kidney replacement therapy in older patients with AKI in the intensive care unit. Design, setting, participants, & measurements Our study was a prospective cohort study in 16 Canadian hospitals from September 2013 to November 2015. Patients were ≥65 years old, were critically ill, and had severe AKI; exclusion criteria were urgent kidney replacement therapy for a toxin and ESKD. We recorded triggers for kidney replacement therapy (primary exposure), reasons for not receiving kidney replacement therapy, 90-day mortality (primary outcome), and kidney recovery. Results Of 499 patients, mean (SD) age was 75 (7) years old, Charlson comorbidity score was 3.0 (2.3), and median (interquartile range) Clinical Frailty Scale score was 4 (3–5). Most were receiving mechanical ventilation (64%; n=319) and vasoactive support (63%; n=314). Clinicians were willing to offer kidney replacement therapy to 361 (72%) patients, and 229 (46%) received kidney replacement therapy. Main triggers for kidney replacement therapy were oligoanuria, fluid overload, and acidemia, whereas main reasons for not receiving therapy were anticipated recovery (67%; n=181) and therapy not consistent with patient preferences for care (24%; n=66). Ninety-day mortality was similar in patients who did and did not receive kidney replacement therapy (50% versus 51%; adjusted hazard ratio, 0.78; 95% confidence interval, 0.58 to 1.06); however, decisions to offer kidney replacement therapy varied significantly by patient mix, acuity, and perceived benefit. There were no differences in health-related quality of life or rehospitalization among survivors. Conclusions Most older, critically ill patients with severe AKI were perceived as candidates for kidney replacement therapy, and approximately one half received therapy. Both willingness to offer kidney replacement therapy and reasons for not starting showed heterogeneity due to a range in patient-specific factors and clinician perceptions of benefit. Older critically ill patients are at higher risk for severe AKI (1). Observational data show that approximately one half of patients in the intensive care unit (ICU) who receive kidney replacement therapy for AKI are ≥65 years of age (1–3). Older patients in the ICU who have AKI and receive kidney replacement therapy are at greater risk for death compared with younger patients. In a subgroup of the Study to Understand Prognoses and Preferences for Outcomes and Risks of Treatments (SUPPORT), older patients in the ICU (≥65 years old) who received kidney replacement therapy had survival of 27% at 5 months (4). Anticipation of poor survival may partly explain the variation in kidney replacement therapy provided to older patients (5,6). A multicenter study found that older patients in the ICU (≥80 years old) were less likely to receive kidney replacement therapy compared with a matched cohort of younger patients (7). Selected studies have further implied that age alone is independently associated with the provision of life-sustaining therapies in the ICU, including kidney replacement therapy (5,7,8). Although factors, such as age, cognitive impairment, multimorbidity, frailty, and functional status, are likely determinants of higher mortality among older patients in the ICU, outcomes for selected older patients have been shown to be better than expected (8–10). There is limited information on factors that trigger initiation of kidney replacement therapy in older patients with AKI in the ICU. Similarly, no study has specifically examined influences for decisions to provide kidney replacement therapy to older patients in ICU settings (11,12). Accordingly, our aim was to describe factors, care processes, and outcomes associated with a willingness to initiate kidney replacement therapy and the actual receipt of such therapy in older patients in the ICU. Approval was received by the Research Ethics Board at the University of Alberta (File Pro00037850) and each participating center. All participants or their legally authorized surrogate provided informed consent. This study follows the recommended reporting outlined in the strengthening the reporting of observational studies in epidemiology (STROBE) Statement (13). The Optimal Selection for and Timing to Start Renal Replacement in Critically Ill Older Patients with Acute Kidney Injury study was a multicenter, prospective, observational cohort study conducted in ICUs at 16 academic/tertiary hospitals across Canada between September 23, 2013 and November 18, 2015. We recruited older patients in the ICU with severe AKI and a high likelihood of receiving kidney replacement therapy. Specific inclusion criteria were age ≥65 years old and severe AKI aligned with the Kidney Disease Improving Global Outcomes consensus definition for AKI defined by at least one of the following: (1) threefold increase in serum creatinine from a known premorbid baseline or during the current hospitalization, (2) serum creatinine >4.0 mg/dl (>354 μmol/L) with evidence of a minimum increase of 0.3 mg/dl (27 μmol/L), (3) urine output <7.2 ml/kg during the past 24 hours, (4) complete anuria for the preceding 12 hours, or (5) twofold increase in serum creatinine from a known premorbid baseline or during the current hospitalization and total urine output <6.0 ml/kg over the preceding 12 hours (or <2 ml/kg over 4 hours). Exclusion criteria were known drug toxicity that required kidney replacement therapy or preexisting ESKD. The receipt of kidney replacement therapy was defined as the administration of at least one session of any modality. Sepsis was defined according to consensus guidelines at the time of the study (14). Acuity was measured using the Acute Physiology and Chronic Health Evaluation II (APACHE II) score at ICU admission (15), and organ dysfunction/failure was measured using the Sequential Organ Failure Assessment (SOFA) score within 24 hours of fulfilling eligibility (16). Comorbidity was defined as the presence of at least two chronic illnesses (17) in the domains captured by the Charlson comorbidity score (18). Prehospital disability was defined as difficulty or inability to perform activities essential for independent living (17). Prehospital frailty was defined as a multidimensional loss of reserve and deficit accumulation that gives rise to vulnerability, and it was defined as a Clinical Frailty Scale score greater than or equal to five (19,20). Prehospital cognitive function was measured using a validated six-item screening tool (21). Health-related quality of life was measured using the EuroQol (version 1, 2011). The primary study outcome was 90-day all-cause mortality. Secondary outcomes were mortality in hospital and at 12 months, kidney replacement therapy dependence at hospital discharge and 12 months, health-related quality of life at 6 and 12 months, and rehospitalization through 12 months. Data were captured from participants, their surrogates, and attending physicians as well as through review of health records. Each participant/surrogate was interviewed by trained coordinators for sociodemographic details (i.e., residence, function, home support, and frailty) and recent hospitalizations. A physician’s willingness to offer kidney replacement therapy, triggers for starting kidney replacement therapy, and reasons for not initiating kidney replacement therapy were obtained from physicians and health records. Health records were reviewed for documentation of goals of care at ICU admission, changes occurring in ICU, and status at ICU discharge (i.e., full support, no cardiopulmonary resuscitation [CPR] but ICU readmission, or no CPR and no ICU readmission). Participants were contacted at 6 and 12 months to ascertain vital status, residence, ongoing kidney replacement therapy, and health-related quality of life. Data were captured on a web-based patient report form using Medidata RAVE (Medidata Solutions Inc.) (Supplemental Material). Data were managed at the Applied Health Research Center, St. Michael’s Hospital (Toronto, Canada). Sample size calculation was on the basis of data from the Canadian Acute Kidney Injury (CANAKI) study (3,22). In this study, all participants received kidney replacement therapy, 38% (n=89) were ≥65 years old, and hospital mortality was 55%. From the CANAKI study data, we conservatively expected to observe 50% mortality at 90 days and 65% mortality at 1 year. We planned a sample size of 500 patients to yield mortality estimates ±4.5% at 90 days and ±4.4% at 1 year. This sample would enable the consideration of approximately 25 covariates in multivariable models to explore the relationship between kidney replacement therapy utilization and mortality. Continuous variables were summarized using means and SDs or medians and interquartile ranges. Categorical variables were summarized using percentages. All variables were compared using t tests or Wilcoxon rank sum tests for continuous variables and Fisher exact tests for categorical variables as appropriate. Kaplan–Meier analyses and log rank tests were used for comparisons of 90-day survival between those who did and those who did not receive kidney replacement therapy. Cox proportional hazards models with 90-day follow-up were used to evaluate adjusted associations between receipt of kidney replacement therapy and mortality. Schoenfeld partial residuals were used to test for the proportionality of hazards assumption (23). A subanalysis was done for those alive at ICU discharge. Similar models were used to examine secondary outcomes at 6 and 12 months. Patients with missing data were censored at the time of the last known contact. We conducted a complete patient analysis, whereby patients with missing data for one or more covariate(s) were excluded from the analysis; however, we also performed sensitivity analysis with imputation of missing data to assess the robustness of models (Supplemental Tables 1–7). Multivariable logistic regression models were used to examine factors associated with a willingness to offer kidney replacement therapy as well as receipt of kidney replacement therapy. Odds ratios (ORs) with associated 95% confidence intervals (95% CIs) were reported. Variance inflation factors were used to assess multicollinearity. Validation and calibration of the models used bootstrap techniques (24). All variables were prespecified to avoid biased estimates of SEMs and 95% CIs (24). We enrolled 499 patients whose mean (SD) age was 75 (7) years old, 41% (n=204) were women, mean (SD) Charlson score was 3.0 (2.3), and median (interquartile range) Clinical Frailty Scale score was 4 (3–5), with 31% (n=141) identified as frail (Figure 1). The most common diagnostic categories were sepsis (27%; n=130), cardiovascular (26%; n=126), and respiratory (21%; n=99). At enrollment, 82% (n=397) had stage 3 AKI, mean (SD) APACHE II score was 28.1 (8.7), 64% (n=319) received mechanical ventilation, and 63% (n=314) received vasoactive support. Flow diagram showing the proportion of participants stratified by willingness to offer kidney replacement therapy, receipt of kidney replacement therapy and mortality. Other reasons for exclusion included non-English speaking, repatriated to another country, and already participating in a clinical trial. A total of 14 participants were omitted from 90-day mortality: four withdrew consent before 90 days, and ten were lost to follow-up (n=4 from willingness to offer/no receipt of kidney replacement therapy, n=7 from willingness to offer/receipt of kidney replacement therapy, and n=3 from no willingness to offer/no receipt of kidney replacement therapy). OPTIMAL-AKI, Optimal Selection for and Timing to Start Renal Replacement in Critically Ill Older Patients with Acute Kidney Injury. We could not ascertain 90-day vital status of 14 (3%) patients: four (1%) withdrew consent, and ten (2%) were lost to follow-up. Data were >95% complete for the remaining patients, except for baseline cognitive assessment (n=26; 95%) and Clinical Frailty Scale score (n=37; 93%) (Supplemental Table 1). Clinicians reported that they were willing to offer kidney replacement therapy to the majority (n=361; 72%) of older patients with AKI (Table 1). Those less likely to be offered kidney replacement therapy had greater comorbidity and frailty at baseline along with lower APACHE II scores and lower peak serum creatinine values (Supplemental Table 2). In multivariable analysis, Charlson score (adjusted OR, 0.87; 95% CI, 0.77 to 0.98), documentation of goals of care status at ICU admission (adjusted OR, 0.42; 95% CI, 0.25 to 0.71), and receipt of vasoactives (adjusted OR, 0.46; 95% CI, 0.22 to 0.95) were associated with a lower likelihood of willingness to offer kidney replacement therapy, whereas higher SOFA score (adjusted OR, 1.19; 95% CI, 1.09 to 1.30) and metabolic/endocrine diagnostic category (adjusted OR, 4.40; 95% CI, 1.13 to 17.2) were associated with a higher likelihood of willingness to offer kidney replacement therapy (Supplemental Table 3). In a sensitivity analysis with imputation, a higher Clinical Frailty Scale score and a higher cardiovascular diagnostic category were also associated with lower likelihood of willingness to offer kidney replacement therapy. At ICU admission, 64% of patients had goals of care status documented (Table 1). Among those with documented goals of care, there was greater willingness to offer kidney replacement therapy, whereas among those with no willingness to offer, fewer received therapy. Patients with limitations in medical therapy (i.e., no CPR with or without ICU readmission) were less likely to be offered kidney replacement therapy and less likely to receive it, although this was not statistically significant. Among patients discharged from the ICU, goals of care status was changed in 41% (n=206): those to whom there was no willingness to initially offer kidney replacement therapy had changes occur more often than those to whom the clinician was willing to offer therapy (49% versus 38%; P=0.03). A total of 229 (46%) patients received kidney replacement therapy (Table 1). Kidney replacement therapy was initiated a median (interquartile range) of 1.0 (0.0–3.0) day after ICU admission. The primary triggers for starting kidney replacement therapy were oligoanuria, fluid overload, and acidemia (Supplemental Table 4). One hundred ninety-nine (40%) patients had two or more triggers for kidney replacement therapy, and 111 (22%) patients had three or more triggers for kidney replacement therapy. The most common reasons for not starting among patients not receiving kidney replacement therapy were anticipated kidney recovery (n=181; 67%), therapy not consistent with patient goals of care (n=66; 24%), and a decision to withhold or withdraw life support (n=29; 11%). Among patients to whom clinicians were not willing to offer kidney replacement therapy, the reasons for not starting were similar: anticipated recovery of kidney function (56%; n=71 of 126) and therapy not being consistent with patient goals of care (37%; n=47 of 126); however, 9% (n=12 of 138) ultimately received treatment with kidney replacement therapy (Tables 2 and 3). Primary reasons for not starting kidney replacement therapy for participants stratified by initial willingness to offer kidney replacement therapy as judged by intensive care unit clinicians. Those treated with kidney replacement therapy had less multimorbidity and frailty, had higher illness acuity, and were more likely to receive mechanical ventilation and vasoactive support compared with those who were not treated (Table 1). In multivariable analysis, older age (adjusted OR, 0.94; 95% CI, 0.91 to 0.97) and cardiovascular diagnostic category (adjusted OR, 0.44; 95% CI, 0.23 to 0.85) were associated with a lower likelihood of receiving kidney replacement therapy, whereas higher SOFA score (adjusted OR, 1.31; 95% CI, 1.20 to 1.43) and metabolic/endocrine diagnoses (adjusted OR, 3.81; 95% CI, 1.48 to 9.82) were associated with a higher likelihood of receiving therapy. In sensitivity analyses with imputation, prehospital residence in an assisted living or nursing facility was associated with lower likelihood of receiving therapy, and the receipt of vasoactives was associated with a higher likelihood of receiving therapy (Supplemental Tables 5 and 6). Mortality at 90 days was 50% (n=112 of 222) for patients who received kidney replacement therapy versus 51% (n=135 of 263) for those who did not (adjusted hazard ratio, 0.78; 95% CI, 0.58 to 1.06; P=0.92) (Figure 2, Table 3). When stratified by initial willingness to offer therapy, mortality at 90 days was 48% (n=169 of 350) in those for whom there was willingness to offer therapy versus 58% (n=78 of 135) in those for whom there was no willingness to offer therapy (P=0.08). 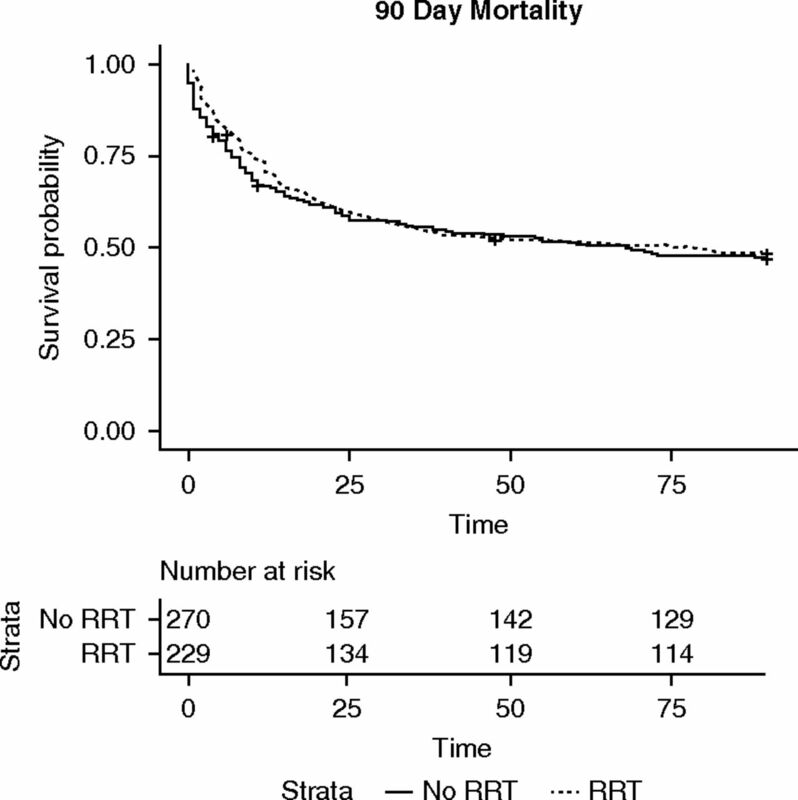 Kaplan–Meier plot showing no difference in survival truncated at 90-days stratified by receipt of kidney replacement therapy (log rank, P=0.57). For those not receiving kidney replacement therapy, 90-day mortality was greater for patients who deteriorated before starting therapy, who had ICU support withheld/withdrawn, and for whom therapy was not consistent with documented goals of care compared with patients in whom kidney recovery was anticipated (Supplemental Table 4). Factors associated with death through 90 days included older age (adjusted hazards ratio, 1.03; 95% CI, 1.01 to 1.05), Charlson score (adjusted hazards ratio, 1.06; 95% CI, 1.00 to 1.12), receipt of mechanical ventilation (adjusted hazards ratio, 1.52; 95% CI, 1.07 to 2.17), receipt of vasoactives (adjusted hazards ratio, 1.60; 95% CI, 1.13 to 2.26), and primary neurologic diagnosis (adjusted hazards ratio, 2.47; 95% CI, 1.08 to 5.62). There was no statistical association between hazards of death and receipt of kidney replacement therapy (adjusted hazards ratio, 0.78; 95% CI, 0.58 to 1.06). In a similar analysis conditional on survival to ICU discharge (n=309; 64%), there was also no statistical difference in hazards of death between those who did and did not receive kidney replacement therapy (41% versus 59%; adjusted hazards ratio, 0.74; 95% CI, 0.44 to 1.25). Additional sensitivity analyses, including use of imputation of missing data and treating kidney replacement therapy as a time-dependent variable, are shown in Supplemental Table 7. There were no significant differences in rehospitalization rate at 6 and 12 months or in discharge disposition by whether patients were treated with kidney replacement therapy. Health-related quality of life was completed by 91% (n=176) and 89% (n=155) of survivors at 6 and 12 months, respectively. Quality of life was impaired among survivors, with no significant differences in EuroQoL visual analogue scale (EQ-VAS) scores when stratified by receipt of kidney replacement therapy at 6 or 12 months (Table 3). In this multicenter cohort study, we found that clinicians were generally willing to offer kidney replacement therapy to the majority of older critically ill patients with severe AKI and that nearly one half actually received therapy during their ICU course. Patients who were treated with kidney replacement therapy, triggered largely by oligoanuria and perception of fluid overload, had less multimorbidity and greater illness severity, and generally, they also received more nonrenal organ support compared with those who were not treated with kidney replacement therapy. Mortality was similar between patients who did and did not receive kidney replacement therapy in ICU. This is explained, in part, by fundamental differences in patient mix between patients for whom there was and was not a willingness to offer kidney replacement therapy, implying that clinicians used a variety of cues in their decision to determine appropriateness for treatment with kidney replacement therapy. Among patients for whom there was no willingness to provide kidney replacement therapy, there were generally two divergent populations. The first included patients for whom there was a perception of a high likelihood of recovery and improvement, and the second was defined by patients in whom kidney replacement therapy would not be perceived to be beneficial or congruent with patient goals of care. In this latter group, fewer had goals of care status documented on ICU admission, and although a small proportion ultimately received kidney replacement therapy, mortality was substantial. The principal reasons for not starting kidney replacement therapy also showed divergent patterns in association with 90-day mortality. Among patients for whom recovery was anticipated, mortality was relatively low; however, among those patients with deterioration, who had life support withdrawn, or in whom kidney replacement therapy was not consistent with patients’ preferences for care, mortality was markedly greater. Although age alone did not seem to influence clinicians’ willingness to offer kidney replacement therapy, it was associated with lower likelihood of receiving kidney replacement therapy. The aim of this large prospective cohort study of older patients in the ICU with severe AKI focused on decision making related to the provision of kidney replacement therapy, and it enhances prior work by evaluating practices in a wider spectrum of critically ill adults (11,12). In a retrospective cohort study of critically ill adults, Boumendil et al. (7) found that critically ill patients over age 80 years old were one half as likely to receive kidney replacement therapy compared with matched younger patients who were between age 65 and 79 years old. The SUPPORT, although conducted two decades ago, found that the likelihood of withholding kidney replacement therapy was 12% higher per decade increase in age (25). The SUPPORT also suggested that starting kidney replacement therapy and continuing aggressive care rather than withholding therapy in older patients in the ICU was not cost effective, with a cost per quality-adjusted life-year saved of $128,200 (United States dollars), a sum far exceeding common thresholds that are considered cost effective (4). Our findings suggest that willingness to offer and decisions about providing kidney replacement therapy to older patients in the ICU in Canadian ICUs are largely driven by clinical need that was commensurate with their illness severity, AKI severity, and clinician perception of benefit. Moreover, chronological age in isolation did not seem to be a significant consideration. Our study did not detect important differences in survival with the provision of kidney replacement therapy to older patients with severe AKI compared with those not treated, although there is likely heterogeneity in outcome by patient mix. Indeed, outcomes were comparable with contemporaneous cohorts where the average age was younger (26–28). These observations are aligned with recent studies suggesting that reserving kidney replacement therapy for patients who develop conventional triggers is not necessarily associated with greater mortality (11,12). We recognize that confounding by indication limits inferences in our study. The commencement of kidney replacement therapy was driven by multiple factors, which may exert differential effect on clinical outcomes. For example, patients who were not treated with kidney replacement therapy due to anticipated recovery were more likely to have a favorable outcome, whereas those not treated with kidney replacement therapy due to rapid clinical deterioration or the perception of low likelihood of benefit were more likely to have a poor outcome. While acknowledging these limitations, our findings provide reassurance that, when clinicians decide to provide therapy to older adults, treatment was not associated with worse survival. However, it is noteworthy that only 38% of the overall older cohort was alive at 1 year. Among those surviving at 6 and 12 months who reported quality of life scores, although lower than population normative values, findings were similar to scores described in contemporaneous studies of ICU survivors (29–31). Despite the advanced age of our cohort, clinicians were willing to consider kidney replacement therapy initiation in the majority. Prior literature has shown that numerous factors contribute to heterogeneity around decision making for providing ICU support, such as kidney replacement therapy, including patient-related (i.e., multimorbidity frailty, functional status, and care preferences) and organizational factors (i.e., time of day, day of week, and bed availability) (5,6,32–35). Recent data have suggested that clinicians’ decisions to forego life-sustaining therapy, including provision of kidney replacement therapy, among patients in the ICU are influenced by older age, chronic disease, and high acuity (36). In our study, limitations on the escalation of therapy were associated with lower likelihood of clinicians willing to offer kidney replacement therapy. Frailty is increasingly recognized as an important contributor to poor outcomes and survivorship after critical illness and CKD (2,37–40). It remains uncertain how often prehospital frailty status is routinely evaluated in contemporaneous ICU practice and whether frailty may influence decision making around the provision of kidney replacement therapy. Frailty, which was screened for using the Clinical Frailty Scale in our study, is not likely a routine measure across participating ICUs. Notably, however, frailty was more prevalent among older patients to whom clinicians were less willing to offer kidney replacement therapy and among those who did not receive therapy; however, frailty was not associated with 90-day mortality or dialysis dependence. Our study has limitations. First, our study was observational in nature, and the associations that we describe are susceptible to residual confounding. In addition, our study may be prone to selection bias, particularly for older patients who were denied ICU admission or treated with kidney replacement therapy before ICU admission and excluded. Second, although multicentric, our study was relatively small, and we cannot exclude small but significant differences in mortality between those who were treated with kidney replacement therapy and those who were not. Third, although we asked clinicians about their initial willingness to provide kidney replacement therapy or not if indicated, we did not specifically ask about the reasons for why they would be unwilling to provide it. Fourth, our study was performed in a publicly funded health care system in which all participants receive universal health coverage, and our findings may not be generalizable to other jurisdictions. However, we contend that our study is likely generalizable in the sense that clinicians are frequently confronted with older critically ill patients with AKI, and decisions to offer and start kidney replacement therapy are similarly encountered. Fifth, we recognize that the willingness to offer kidney replacement therapy was likely influenced by a multitude of factors, which may have differed by patient, physician, and hospital. Our study adds to the literature by highlighting the challenges and nuances around decision making for kidney replacement therapy initiation in older patients in the ICU. Although selected older patients may derive clinical benefit from starting kidney replacement therapy, such decisions should be juxtaposed with the intermediate and long-term implications. In this context, important patient-centered considerations of kidney replacement therapy treatment in the ICU include failure to recover kidney function and development of new or worsened CKD or ESKD, which are associated with greater impairment in quality of life (41,42). These data can be used to frame and inform discussions with patients and families about the use of kidney replacement therapy in the context of critical illness. The majority of older critically ill patients with severe AKI were considered as candidates for kidney replacement therapy, and approximately one half received kidney replacement therapy. Older patients to whom clinicians were unwilling to offer kidney replacement therapy were either anticipated to recover or had limitations in support that were preexisting or implemented after admission. Initiation of kidney replacement therapy in older critically ill patients, particularly those not anticipated to recover kidney function, was associated with similar survival compared with those who did not initiate kidney replacement therapy. S.M.B. and R.W. report having received honoraria and unrestricted research support from Baxter Healthcare Corp. J.M. is the Scientific Director for the Canadian Frailty Network, which is funded by the Government of Canada. This article contains the following supplemental material online at http://cjasn.asnjournals.org/lookup/suppl/doi:10.2215/CJN.05530518/-/DCSupplemental. Supplemental Table 1. Summary of missing data. Supplemental Table 2. Summary of patient characteristics stratified by whether ICU clinicians would be willing to offer KRT for treatment of severe AKI. Supplemental Table 3. Sensitivity analysis for willingness to offer KRT with imputation of missing data. Supplemental Table 4. Primary triggers for starting KRT and reasons for not starting KRT as judged by ICU clinicians stratified by vital status at 90 days. Supplemental Table 5. Summary of patient characteristics stratified by whether patients received KRT for treatment of severe AKI. Supplemental Table 6. Sensitivity analysis for receipt of KRT with imputation of missing data. Supplemental Table 7. Summary of multivariable Cox regression analysis for the association between receipt of KRT and 90-day mortality. This work was supported by Canadian Frailty Network Grant 2013-RFP2012-15-06. S.M.B. was supported by a Canada Research Chair in Critical Care Nephrology. H.T.S. was supported by a Canadian Institutes of Health Research Embedded Clinician Researcher Award. The funding agency had no role in the design or conduct of the study; the collection, management, analysis, or interpretation of the data; or the preparation, review, or approval of the manuscript. Collaborators were as follows: University of Alberta Hospital, Edmonton: S.M.B. and Nadia Baig; Sunnybrook Health Sciences Centre, Toronto: N.K.J.A., Nicole Marinoff, and Adic Perez; St. Michael’s Hospital, Toronto: K.E.A.B., J.O.F., R.W., Julia Lee, Yoon Lee, Kurtis Salway, Gyan Sandhu, Orla Smith, and Melissa Wang; Hôpital du Sacré-Coeur de Montréal, Montreal: J.B. and Anatolie Duca; Centre de Recherche du Hospitalier Universitaire de Sherbrooke, Sherbrooke: F.L., Patrick Bérubé, and Hélène Fournier; Ottawa Hospital, Ottawa: L.A.M., Irene Watpool, Rebecca Porteus, and Brigette Gomes; Centre Hospitalier Universitaire de Montréal, Montreal: J.-F.C. and Fatna Benettaib; St. Paul’s Hospital, Vancouver: P.D., Betty Jean Ashley, and Victoria Alcuaz; Foothills Medical Centre, Calgary: H.T.S. and Stacey Ruddell; Toronto General Hospital, University Health Network, Toronto: M.H. and Andrea Matte; Mount Sinai Hospital, University Health Network, Toronto: S.L. and Sumesh Shah; Kingston General Hospital, Kingston: J.M., Miranda Hunt, and Ilinca Georgescu; St. Paul’s Hospital, Saskatoon: J.B. and Dorota Polewicz; Vancouver General Hospital, Vancouver: D.G. and Denise Foster; St. Joseph’s Hospital, Hamilton: M.S. and Kristine Wachmann; and Applied Health Research Centre, Li Ka Shing Knowledge Institute, St. Michael’s Hospital: A.A., G.L., Nike Onabajo, Hannah Chung, and Karen Pope. ↵*A complete list of nonauthor contributors appears at the end of this article. See related editorial, “Complex Decision Making about Dialysis in Critically Ill Older Adults with AKI,” on pages 485–487.